Orlando was spellbound this weekend as wizards, witches and muggles alike flocked to the third Universal Orlando Celebration of Harry Potter event. Whether they apparated, used the Floo network, or came via broom, the turn out was amazing and I was lucky enough to be one of the many Harry Potter fans in attendance. Universal Orlando is home to both Hogsmeade and Diagon Alley, where Potterheads can come and feel like they’re truly living in the Wizarding World of Harry Potter. 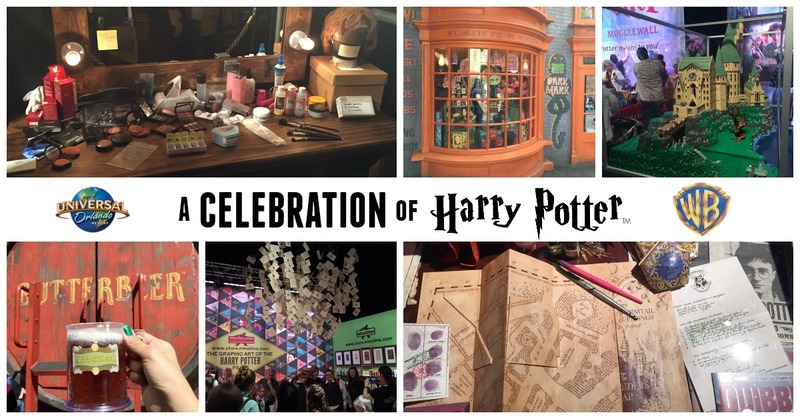 This weekend the added Celebration was a 3-day event that included house sorting, how to dance like a Beauxbaton or battle like a Durmstrang, prop and graphic design panels, and an expo filled with exclusive souvenirs and special exhibits. Celebrity guests Rupert Grint (Ron Weasley), Matthew Lewis (Neville Longbottom), Bonnie Wright (Ginny Weasley), Evanna Lynch (Luna Lovegood), and Katie Leung (Cho Chang) were also in attendance for exclusive Q&A talent panels. One of the most exciting things about the Universal Orlando Celebration of Harry Potter was the outfits and costumes that fans wore. You could find many donning their Hogwarts house robes as well as people dressed as some of their favorite characters. Even I got in on the fun and put together my best Luna Lovegood inspired outfit. Some of my favorites outfits included a golden snitch, Professor Snape as Neville’s grandmother, and a seriously convincing Rita Skeeter complete with feather quill and bright green jacket. It was thrilling to hear the latest Harry Potter news announced for the first time while there. Fans got to see an exclusive clip for Fantastic Beasts and Where to Find Them and watch a behind-the-scenes tour of the Palace Theater, where the London stage-production of Harry Potter and the Cursed Child will take place. Perhaps the most mind-blowing news, however, was delivered by J.K. Rowling through Evanna Lynch – the location of four other wizarding schools. There are eleven schools total, three of which we already know: Hogwarts, Beauxbaton, and Durmstrang. Now we know of the existence of four more schools including Castelobruxo in Brazil, Mahoutokoro in Japan, Uagadou in Africa, and my personal favorite and the school we got the least info on, Ilvermorny in North America. There were many excellent panels, giving us all insight into the behind the scenes of the Harry Potter films. Some of the panels included Bringing the Harry Potter™ Films to The Wizarding World of Harry Potter™, The Global Impact of Harry Potter™: The Exhibition which will be happening in Brussels later this year, and Graphic Design for the Harry Potter™ Films with MinaLima. Each panel gave info that any die-hard Harry Potter fan would love to know and it was fascinating to hear how everything was created and finalized to make the movies the absolute best they could be. My favorite panel was the Harry Potter™ Props Showcase with Acclaimed Prop Maker Pierre Bohanna. I couldn’t believe the amount of planning, work, and often re-work that went into making each prop for the movies. Wands, for example, were specific to each character and an original was created out of wood and then multiples were made out of resin or rubber to be more durable and safe during filming. Also, the original bludger ball had two more scalloped parts, which were later removed due to it making the ball difficult to hold and catch, and was originally made of steel and wood before being finalized in both resin and rubber. Paul Harris, the wand dueling master, spoke during this panel as well and showed us a few moves before he was interrupted by Death Eaters. Thankfully Matthew Lewis was there to save the day. The main attraction of Universal Orlando Celebration of Harry Potter was the expo. Inside the expo you could find exclusive merchandise only available at the expo and displays for Scholastic, Pottermore, Harry Potter and the Cursed Child, MinaLima – the dynamic duo behind all of the graphic designs for Harry Potter, and Warner Brothers Studio Tour in London. Everywhere you turned there was something amazing to see or do, but the WB Studio Tour was by far the most magical part. The line to get in the WB Studio Tour, although long, was absolutely worth waiting in as this display showcased a portion of what you can see at their London location. Two prop makers, Tracey Curtis and Catriona Meridew, were busy making wands as guests began the tour. They shared how the wands were made and how important it is to have an art director when making props. After learning about props, you move into the next room with hair and makeup items. I know I wasn’t the only person internally geeking out at seeing some of the things on the table. I don’t think I’ll even be able to forget seeing Bellatrix’s teeth or the infamous scar of the Boy Who Lived. One of the most fascinating items was the green Dark Mark tattoo. Although they appear black in the film, the tattoos were green because they needed to use CGI in order to make them move in the movies. Wormtail’s missing finger was also painted green so that it could be removed during the film editing process. The tour ended with a photo opp and a whole new sense of appreciation and wonder for the magic that’s created behind the scenes. Magical is truly the only word to describe this event. Walking through both Hogsmeade and Diagon Alley, mug of Butterbeer in hand, allowed me to feel like I really was right in the heart of my favorite story and affirmed that magic really can exist if only we believe. The Universal Orlando Celebration of Harry Potter brings together wizards, witches, and Muggles once a year in the most perfect place to nerd out about every and all things Potter. Now if only I had a time-turner so I could go back and experience it all over again. Danielle is an Associate Editor at The Fairytale Traveler specializing in lifestyle, family and products. She's a married mom of one, is an Orlando, FL native and writes on her blog about living the geeky life. She has a love of all things nerdy, is a bit of a crazy cat lady, and enjoys baking and crafting with her son. She can often be found with her nose in a good book or playing at Disney. I was there as well and had a great time! The lines were pretty rough and crowd control for the big events could use some work. Hopefully next year it’ll be a bit smoother! Do you get to take pictures with the celebrity’s from the film that are there? Thank you Erin! Hope to see you there next year! This looks awesome! I’ve done the Leavesden tour, but it looks like this event had some things even that tour was missing! Wish I was living in Orlando and I would’ve been there for sure. At least we get to live it vicariously through Danielle for this year! Glad to hear you enjoyed it. Hope to see you next year! How much fun is that? Our entire family enjoyed the Harry Potter movie series and the books. I know my kids would have loved to attend this celebration! We thought about taking the kids to orlando but we felt that they were a little too young for Universal. Looks like you had a ton of fun! I have to admit…I know NOTHING about Harry Potter. It sounds and looks like you had a wonderful time at the Universal Orlando Celebration of Harry Potter event. I have not yet been to Universal Studios but would love to go there soon. My sons would so love this event and the expo sounds so amazingly interesting. Thanks for sharing the event. Indeed it is amazing and a great plan for a first visit! A woman after my own heart! I grew up in Florida just hours away from Orlando and watched all of my friends go to this celebration. Seems like it was incredible. I NEED to make it out next year. I have not been to Universal Studio’s in years. I bet my kids would really enjoy it! How fun is this?! My family and I have been to Universal Orlando twice in the past two years, both times we visited Th Harry Potter areas and had so much fun!! Our favorite is the flight of griffindor!! perfect for small kids that love fast rides. Great report from Danielle. Sounds like Potterhead heaven!! This looks like a great way to celebrate! I would love to visit! This is definitely on my bucket list of things to do when in Florida! YES! We made someone’s bucket list!!!!!!!!!!!!!!!!!!!!!!!!!!!!!! Oh my goodness, I am so absolutely jealous that you were able to attend this event. One of my goals is to get my family to Orlando this year and I can’t wait to be a part of everything Harry Potter! Fun, fun! I hope you had an amazing time! Next year awaits with magic and lore! I haven’t been to Universal since I was a kid and it looks like they have added so much cool stuff especially the Harry Potter area! Can’t wait to check it out! I’m like “will you rent me a place on Diagon Alley”? That would be the jam. Omg this must of been so fun!!! I lived in Orlando for years and just loved going to stuff like this! The Fairytale Traveler is a travel and lifestyle blog inspired by the greatest stories ever told. It follows the adventures of Christa and her son Gauge as they explore the world's magical, otherworldly and fairytale-like places, places that inspired great stories, film locations, creepy places, historic sites, castles, and just about anything suited for royalty. They love myth, legend and lore, books, film, and fandoms. Along with travel stories, travel tips, and travel guides, they feature product reviews on cars, gadgets, and smart technology, and write Gift Guides on travel gear, geeky collectibles, housewares, home decor and more. Visit The Fairytale Traveler's profile on Pinterest.